Tonight’s episode is one that is very close to my heart. 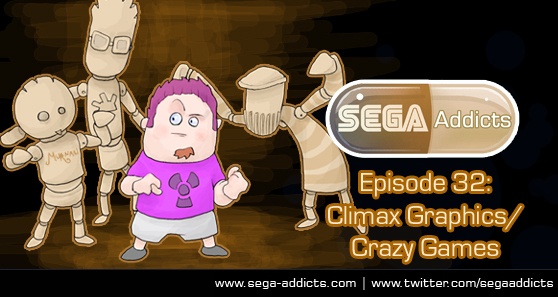 We’ll be discussing developer Climax Graphics/Crazy Games and their two Dreamcast games Blue Stinger and Illbleed. Both games are great examples of why I love the Dreamcast and while neither game is flawless they are both ambitious and give off a feeling that the developer’s were proud of what they were creating and had a fun time doing it. If you’ve got some questions or comments regarding those games or anything Sega related or otherwise leave them below. Also, don’t forget about this week’s contest to win a copy of Blue Stinger for Sega Dreamcast! And on the left there’s a great poll about Illbleed. You should answer it! Poll results: What is your favorite Sega console? For a person who’s never even heard of these games how would you describe them? Since remakes are all the rage right now, If you could pick any team (sans the obvious choice of Platinum) to remake these two games, who would you pick for each, and why? And Sonic vs. Zonic. Who wins in a cage fight. Q2: If you could create your own “attraction/level/area” in Illbleed, what would the premise be? Must include very tasty sandwiches and that elastic, wrinkly skin that old people have hanging off of their necks that remind me of rooster wattles. And, of course, it must be…terrifying!